Cool Jerk » Archive » Saturday is Free Comic Book Day! This Saturday (May 3), I’ll be participating in FREE COMIC BOOK DAY at my favorite San Diego comics shop, Southern California Comics in Clairemont Mesa. I’ll be there peddling my wares… and in keeping with the spirit of FCBD, I’ll be offering a BUY TWO GET ONE FREE with every book, t-shirt or canvas panel purchase! Mix and match! I won’t be the only local comics creator there, either. It’s going to be like a mini comic-con! SCC’s owner, Jamie Newbold, is pouring a lot of magic into this event so please come by and buy some comics, get some free comics and get some lunch — they’ll have not one but TWO food trucks on site! Plus, they’re cross-promoting with their neighbor Societe Brewing for beer specials! Food, drink, comics… how about some music? He’s got ya covered. Digital Lizards of Doom will be performing live! It’s all day, from 9am-5pm. I’ll be there bright and early. Bring your appetite and some sunscreen! 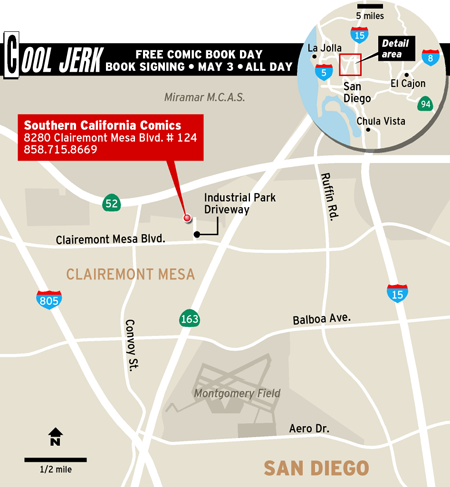 Southern California Comics is kind of tough to find if you haven’t been there before… so here’s a map! Good to meet you at FCBD! You’re just as funny in person as your strip is.